Check out this beautiful used Princes 85 yacht for sale! : Atlantic Yacht & Ship, Inc. Check out this beautiful used Princes 85 yacht for sale! Andrey Shestakov reminds us that the used Princess 85 yacht he has for sale is motivated to sell! This used Princess 85 was launched in 2009 and with a recent price reduction is seriously for sale! In the first place, this yacht has four guests cabins, each with a private en suite bathroom. Together with all the mechanical upgrades and features this yacht is “fully loaded.” As can be seen by the zero-speed stabilization, twin generators, and electro-hydraulic bow & stern thrusters. Furthermore, this yacht is fully air conditioned and fully outfitted with navigation electronics. Generally speaking, this used Princess 85 has everything you need for your yachting experience. After all, she is powered by twin Caterpillar C-32 diesel engines. Moreover, with only 950 hours this yacht has lots of life in her and is ready to cruise. You will cruise at speeds of up to 26-28 knots on this yacht! The luxury does not end on the interior alone. You will love sitting on the fly bridge or having a drink on the aft deck. 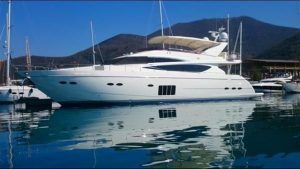 Fore more information on this beautiful used Princess 85 yacht for sale be sure to contact Andrey Shestakov today!